Evgeny Tomashevsky is a Grand Master from Russia who won the 2015 FIDE Grand Prix in Tbilisi. His nickname is “The Professor” since he looks serious, wears glasses and has graduated from the university in Saratov (although he is not actually a professor). Tomashevsky prefers to play white figures. Evgeny Yurievich Tomashevsky was born in Saratov, Russia on 1 July 1987. In 1997, Tomashevsky won the bronze medal in the U-10 Europe Championship. In 2001, a not yet 14 year old Tomashevsky won the Under-18 Russian championship in Rybinsk with a score of 9.5 points out of 11 games. In 2004, he placed second in the World U18 Championship. 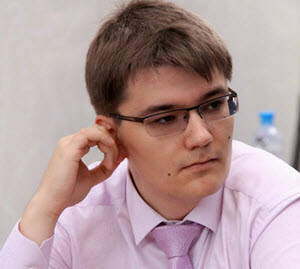 Evgeny Tomashevsky became an International Master at the age of 14 and a Grand Master at the age of 18. Second place in 2007 Aeroflot Open. First place in the 10th European Individual Chess Championship (2009) after tie-breaks. Tomashevsky was a part of the Russian team that won the gold medal at the 2009 World Team Chess Championship in Bursa. In 2011, Tomashevsky tied for first place with Nikita Vitiugov and Lê Quang Liêm in the Aeroflot Open, and eventually placed third on tiebreak. First place in the 2015 FIDE Grand Prix in Tbilisi, with an 8/11 score and no losses. First place in the Russian Championship Superfinal in Chita in 2015. Tomashevsky’s result was 7.5/11.